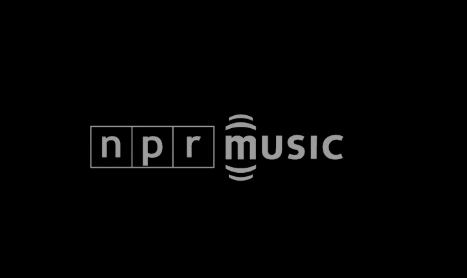 Before heading out on our current European tour, Suzanne and I went down to Washington to play for Bob Boilen at NPR. Bob does a very cool show called “Tiny Desk”. It has a very impromptu feel and we set up and play without any PA. The only microphones used are to record with and so Suzanne had to just sing in the room acoustically. It meant that I had play at a whisper volume so as not to overpower her. Bob wanted me to bring my normal touring rig as he had seen us play a bunch of times; so it was like trying to balance an elephant on a pin, to try to “rock” quietly in the corner. It ended up being alot of fun. We had just come from playing a ball in Brattislavia Slovakia where Suzanne had to hit a huge gong whilst wearing a ball gown , to launch the arts festival in Slovakia. 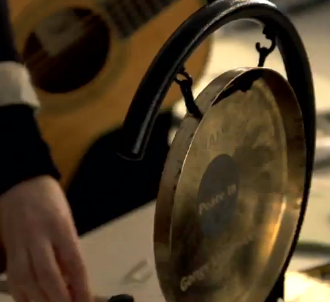 So when I saw the tiny gong on Bobs desk, I encouraged her to hit it before our set. you can hear me murmur that it “makes me feel hungry…”. I guess there are gongs and there are gongs …this one was more like the dinner bell ! Anyhow I hope you enjoy. We play Luka, Crack In The Wall, I Never Wear White, and Toms Diner. February 10, 2014 Performing at the NPR Music offices, the inventive folk-music veteran bookends a four-song set with her hits “Luka” and “Tom’s Diner.” But she also plays two terrific new songs, from album called Tales From the Realm of the Queen of Pentacles, that sound as sharp as anything she’s done. This entry was posted in News and tagged Furch Guitars, Gerry Leonard, gerryleonard, gerryleonardgear, prs, spookyghost, spookyghostgear, Suzanne, Suzanne vega, suzannevega, Tales from the Realm of the Queen of Pentacles. Bookmark the permalink.